IEC TS 62647-3:2014(E) defines for circuit card assemblies a default method for those companies that require a pre-defined approach, and a protocol for those companies that wish to develop their own test methods. 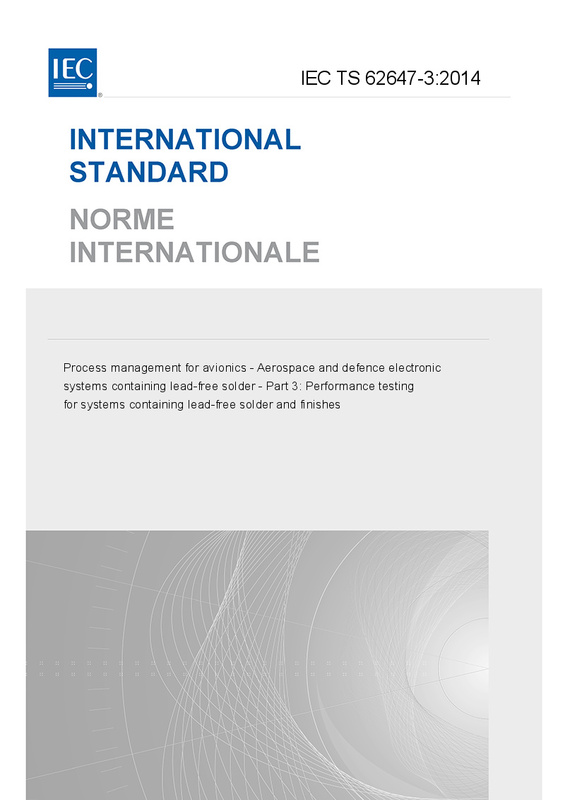 The intent of this document is to aid avionics/defence suppliers in satisfying the reliability and/or performance requirements of IEC/TS 62647-1 as well as support the expectations in IEC/TS 62647-21. The default method is intended for use by electronic equipment manufacturers, repair facilities, or programs that may be unable to develop methods specific to their own products and applications. It should be used when little or no other information is available to define, conduct, and interpret results from reliability, qualification, or other tests for electronic equipment containing lead-free (Pb-free) solder. The default method is intended to be conservative, i.e., it is biased toward minimizing the risk to users of avionics electronic equipment.